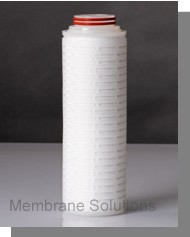 MS® PolyPure-AB Absolute PP Pleated Cartridge Filter uses the raw materials which have permitted by FDACR21. This type of cartridge tolerates a variety of chemical solvents, used in the filtration of ordinary or corrosive fluid. MS offers two absolute filtration pore size: 0.2μm and 5μm, 10inch~40inch different length. Many kinds of connect types can be choose according to customer's requires.